The analysis of response options consists of evaluating and choosing one (or more) solution to the problem (e.g. a policy measure, plan, or project) from a set of plausible alternatives, or producing their complete ranking. Numerous methods and techniques have been developed in decision theory to make explicit (transparent) value judgements and to assess the extent to which different options may contribute to achieve the pursued goals and objectives. The analysis of alternative options is carried out in a participative fashion with an ad hoc workshop or via eParticipation. The Analysis Matrix (AM) is the main reference. The AM stores the performances of the alternative options, evaluated individually against each decision criterion assessed by means of either quantitative indicators provided by model simulations, or qualitative evaluations and preferences of actors and/or other experts. 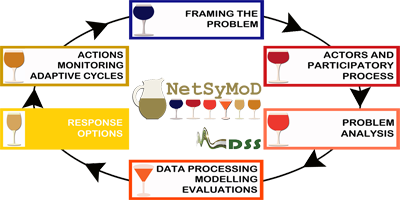 At this stage Multi-Criteria Analysis Methods (MCAM) provide a broad set of techniques for the aggregation of decision preferences, which solve the problem of multiple dimensions to be aggregated in order to identify the preferred solution. All MCA decision rules aggregate partial preferences describing individual criteria into a global preference and rank the alternatives. Examples of MCA techniques implemented in the mDSS software are (i) Simple Additive Weighting (SAW); (ii) Order Weighting Average (OWA); (iii) the Technique for Order Preference by Similarity to Ideal Solution (TOPSIS); and (v) ELECTRE. Most of MCAM consider the issue of weighing of criteria to express a notion of relative relevance. Several techniques for elicitation of weights are available such as pair-wise comparison, swing weighting, direct rating and hierarchical weighting. Moreover, as far as the DSS considers – as it should – the subjective preferences of the involved actors, their different views and preferences (e.g. through the expression of different weighting), divergences are to be expected after the problem analysis, and thus also conflict mitigation/resolution must be performed. This can be implemented in different ways with Group Decision Making techniques, such as using inter-personal preference aggregation, or, simply, by performing parallel evaluation procedures to assess whether or not the diversity of opinions would lead to different results in terms of suggested choice, i.e. ranking of alternatives. The results of the assessment of the options should be adequately documented, and assumptions, subjective choices and uncertainties of various kinds should be transparently communicated with charts, tables, and statistical annexes. Such documentation should allow interested people to go through the decision process step-by-step, by exmining all the details such as definitions, assumptions, parametrisation, etc. On the other hand, effective and concise means should be adopted for communicating the results to a broad public. An example is the interpretation of results in terms of sustainability of the decision ranking provided by mDSS, expressed in terms of balanced environmental, economic, social, and institutional performances of the options analysed.